The Christmas season can be a lot of things. Busy. Magical. Chaotic. Fun. Hard. Beautiful. Exhausting. 1. Taking time to focus on Advent really keeps everything in perspective. It alleviates the fuss and pressure and overwhelming feelings of loss, comparison, etc. etc. etc. and brings attention to the hope and history of a Savior being born so that He could live a spotless life and die a sacrificial death to give us life. Whether it’s an advent study, a calendar with tasks and reminders, a verse a day, parts of THE story once a week, just get in there! Let your affections be stirred by the ultimate peak in THE greatest story of all time when the final Hero enters the epic story of mankind and becomes THE resolution. 2. Stop making/following rules and ridiculous expectations. You can send photo Christmas cards of you or your cat or you and your roommates and their cats. 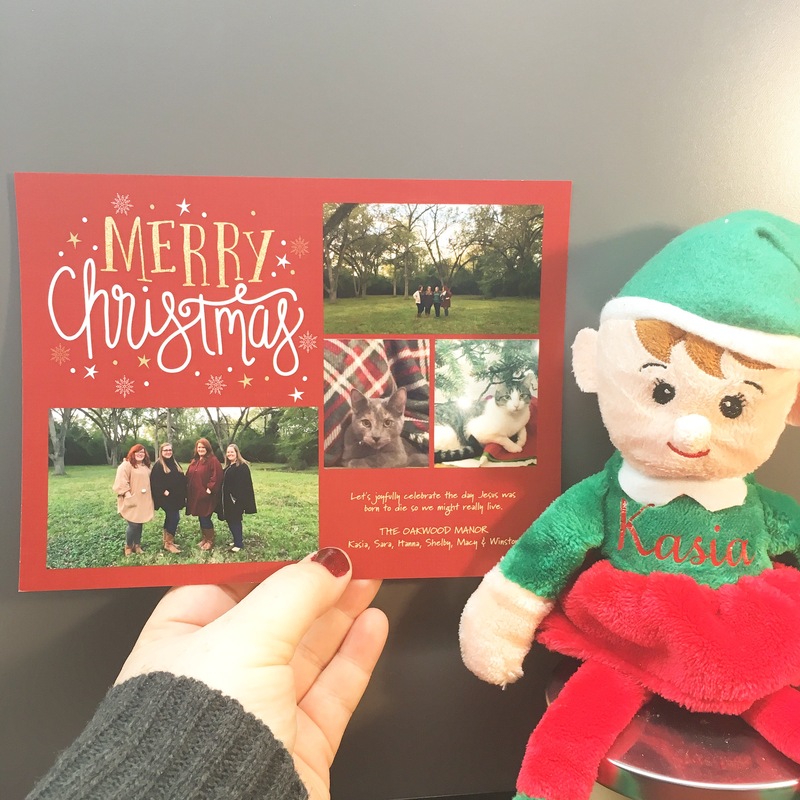 You’re not too old, too young, too single, too child-less, too chubby, or too anything to be on a Christmas card if you want to be on a Christmas card. And if you don’t? DON’T MAKE/SEND THEM! It’s not a rule. There are no rules. Nothing has to be perfect – not your house, your outfit, your party, the candy, the cookies, the gifts, the decor, the cards, the invites, the shelf elves, and everything else. It doesn’t have to be perfect. If trying to make any of it perfect is stressing you out and taking out the enjoyment, drop it! I decorate because I like it. I sent Christmas cards because I wanted to. Do it because you want to and like it, not because you’re supposed to. And for the supposed to’s that you can’t avoid, give yourself some extra love before and after accomplishing it and then MOVE ON to enjoyable things. 3. Spread some Christmas cheer. Christmas really can trigger some unpleasantries rooted in misplaced priorities, focus, and perspective pushed on us by EVERYTHING AROUND. Not everyone gets presents or have people to give them presents, and that can make you selfishly sad for a minute. Not everyone has family to visit for the holiday, another sad minute. And many of us are missing someone we used to get to spend holidays with (loved ones we’ve lost) or someone we’ve never gotten to spend a holiday with (single adults feel their singleness around the holidays more than normal). But you know what? Some people are going through really terrible things – the tragic loss of a child, horrible terminal sickness, living under bridges, stuck in slavery, addicted to all sorts of things, and beyond. There is no better way to take the focus off of ourselves (though it’s okay to be sad and let sadness have it’s minutes! ), than by spreading Christmas cheer to someone else. There are orphans, widows, and oppressed people all around us. And people who just need a Christmas hug! Buy a gift for someone at your local nursing home or a foster child. Bake or buy some cookies for your neighbor. Give your coworkers Christmas cards. Invite someone to your family’s Christmas celebration. and for a super cute elf with my name on it that my coworker gave me for Christmas today! 5. Enjoy it! 2016 is almost here folks. Don’t let the busy of the season cause you to miss it. This year and season is seriously going to be over in a flash. Finish the things you want/need to finish for the year (like your 31 posts KASIA), love on the people you want to love, celebrate the traditions you want to celebrate, start the new traditions you want to start, drink hot cocoa, eat candy canes, watch Elf and all your other favorite Christmas movies, buy some eggnog and forget to drink it, make cookies, wrap presents, build gingerbread houses, wear Christmas pjs. ENJOY THE HECK OUT OF IT! And one extra tidbit for fun. WEAR ALL THE SPARKLY THINGS! Wear red and green together, you never get to do that! Wear Christmas sweaters like crazy (if the weather will cooperate). Wear Christmas earrings. Use all your sparkle polishes. Wear your sequin skirts and dresses and all your sparkly shoes. Add bling! Probably don’t do ALL these things at once, add sparkle tastefully, but do it! Merry Christmas! Let’s make it one to remember.